15. All Alone with the Rhythm. Recorded Jazzology Recording Studios, New Orleans, LA, on Oct. 16, 2000. Prior to Upbeat’s taking over the Jazz Crusade label, this CD was issued by Jazz Crusade under the title All Alone with the Rhythm – Jacques Gauthé (also the title of the last track on the CD, an improvised blues). 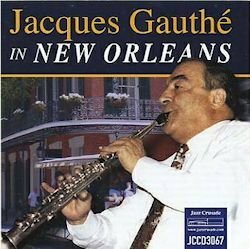 This is that same CD, now reissued by Upbeat under the title Jacques Gauthé – In New Orleans. The group of musicians it features was assembled by Colin Bray, as described by him in the booklet notes. Although not an organized group, they were all consummate musicians assembled for the occasion; however, they were not unacquainted, Kaiser, Mark, and Bray frequently playing together in Canada, and being familiar with Lloyd, visiting New Orleans from Denmark at the time, along with Gauthé, who was by now domiciled in New Orleans from his native France. All of the quintet were, in addition, devotees of the New Orleans style, so they jell very nicely on this album. Gauthé was both an excellent professional chef and musician, but the second calling had the stronger pull, it seems. His mentor on soprano sax was Sidney Bechet, with whom he studied while in France, and although there are traces of Bechet in his playing, he was really his own man. He does not have the wide vibrato so pronounced in Bechet’s playing or the high volume at which Bechet played. Also quite fortunately he does not have Bechet’s giant ego, thus being able to blend in well with the others he plays with, content to allow the spotlight to fall on others in the group by turn; he displays no sense of competition that is so evident in Bechet-led groups where Bechet seems constantly striving to play lead all the time. On this CD, however, he resorts to soprano sax mainly for the odd chorus here and there, relying on clarinet for the bulk for his playing. One exception certainly is Old Fashion[ed] Love where he plays soprano all the way through, and he achieves a very mellow tone, not harsh as do some others on this instrument. But surely no one would, given a blindfold test, attribute the track to Bechet. On clarinet Gauthé is inventive, being at ease in all registers, especially the chalumeau, executing runs and arpeggios appropriately. Here again he is his own person, showing perhaps some traces here and there of some of his teachers other than Bechet— Claude Luter and Albert Nicholas, for example—but not being a clone of any. Gauthés backing on this album is exemplary. All musicians are so obviously listening carefully to each other, coming in at just the right time and volume. They enhance each other’s work, Taff Lloyd in particular providing just the right accents, whether they be tom tom as in S’il Vous Plaît or choice rim shots as in Oh! Lady Be Good , to cite just a couple of instances. Interesting changes of texture are found here and there, such as the fours traded between bass and drums on Smiles , the quiet stop chording behind the drum, banjo, and bass solos on China Boy , or the stop chords backing the breaks throughout by the several instruments on the relaxed My Blue Heaven . Each track has some jewel or two to be appreciated. All of the tunes except the last will be quite familiar, but their treatment here keeps them interesting. This is the kind of CD I would call a form a chamber jazz. It invites one to sit back, glass of favorite beverage in hand to sip while enjoying the listening experience and unwinding after a hard day. The music therein will not encourage jumping up or strutting or dancing, but it will permit having one’s feet on the ottoman and relishing the pleasures of both the libation and the music. It is our good fortune that Upbeat has made it available again. Upbeat CDs are available on the Upbeat web site www.upbeat.co.uk as well as on-line from sites such as Amazon and CD Universe.